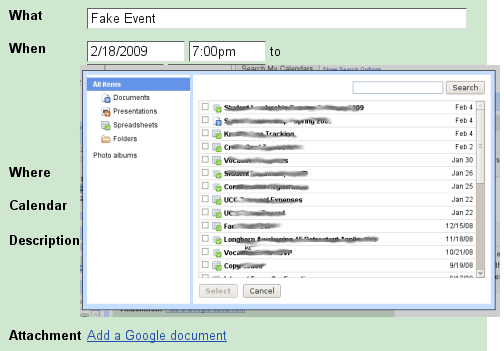 Brandon Kraft spotted a new feature in the Google Apps version of Google Calendar: attaching files from Google Docs and photos from Picasa Web Albums to an event. Sometimes you can provide all the details of an event in the description box and you may need to attach photos, presentations and other useful documents. What I don't understand is why there's no rich-text editor in Google Calendar, where you could drag and drop content from web pages and even images. Hopefully, when GDrive finally launches, you'll be able to access the files stored in Google's Web Drive from any other Google service. I've long wished I could attach a gmail message/thread to a calendar event since many of my events come from emails. Instead I copy and paste a lot. It is impossible to have a Picasa account linked to a Google Apps account, right? It seems like somewhat of a misfeature in that respect. You can add the permalink of a Gmail thread instead of copying its content. That's the reason why the option to add photos from Picasa Web doesn't work yet. Wow, I like the fact that they make the changes first to Google Apps users, that is a good thing, the offline and the others were first seen in Google Apps...But we don't have themes yet! Looks like calendar is slowly turning into project management tool. At least I hope so, because one of the features I dream to welcome in G Calendar is something like simple formulas for numbers included in the events, that could calculate periodical flow of expenses/ revenues, for example. I like to have a summary of all my major spendings to keep with budget, and this is important to make it in calendar, not in spreadsheet, because context of events (private and public) is important. This also looks like picasaweb is coming to Google Apps. I'm looking forward to it, I often have only a picture I want to share. How come I do not see it on my calendar? I am using Chrome. Is it just me or is Google Calendar showing at half-width in Opera recently? My google calendar does not have the attachment option. Why is that? Is there anything I need to activate beforehand? Pretty sure it's for google apps NOT google docs. They are different products. Confusing. There is a way of using google calendar to have posibility of attaching files from google docs without google apps? You will find a list of features there. Google docs attachment is one of them. Cannot see attachments from Android google calendar api :(. Would be super helpful.